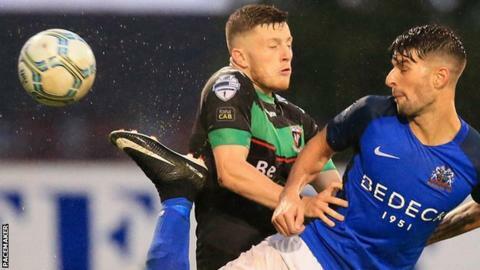 Coleraine moved two points clear at the top of the Irish Premiership by beating Warrenpoint after overnight leaders Glenavon were held by Glentoran. Jamie McGonigle and Darren McCauley got the goals for the Bannsiders while Warrenpoint's scorer Darren Murray was later sent off for two yellow cards. Former Glenavon player Robbie McDaid scored twice for Glentoran but sub Josh Daniels scored late on to make it 2-2. Carrick beat Ballinamallard 2-0 and Dungannon Swifts won 1-0 away to Ards. Linfield can draw level on 12 points with Coleraine if they beat Ballymena United at home on Saturday. Glenavon had looked on course to maintain their 100% start when they took the lead against Glentoran through a low drive by striker Andrew Mitchell. But McDaid came on as a sub and netted in the 80th and 84th minutes to swing the Mourneview match in favour of the Glens. However Daniels, a recent signing from Derry City, scored the equaliser for Glenavon with a low strike in a frantic goalmouth scramble. Jamie McGonigle's 16th-minute strike put Coleraine in front at home to Warrenpoint but the Premiership new boys equalised just before half-time through Murray's well-taken volley. However, former Portadown striker Murray was dismissed early in the second half for a second booking and McCauley snapped up Coleraine's winner in the 69th minute. Dungannon got their first points of the season as Dougie Wilson's deflected free-kick in the 71st minute proved enough for a 1-0 win away to Ards. The free-kick was awarded for a foul which led to defender Dave Elebert being sent-off for a second yellow card offence on his debut for Ards. Colin Nixon's men are now the only team without a point in the Premiership. Andrew Mooney scored both goals as Carrick Rangers secured their first victory, a 2-0 home success over Ballinamallard. To sum up a disappointing night for the Mallards, Ryan Curran saw a late penalty saved by Harry Doherty.